ACE was developed as a research idea born from "VoIP Hopper" to automate VoIP attacks that can be targeted against names in an enterprise Directory. The concept is that in the future, attacks will be carried out against users based on their name, rather than targeting VoIP traffic against random RTP audio streams or IP addresses. 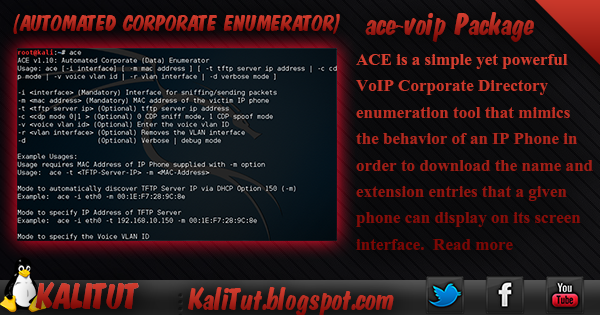 ACE works by using DHCP, TFTP, and HTTP in order to download the VoIP corporate directory. It then outputs the directory to a text file, which can be used as input to other VoIP assessment tools. ACE is a standalone utility, but its functions are integrated into UCSniff. Voice over IP (VoIP) is an exciting technology which provides many benefits and cost effective solutions for communication. More and more small and enterprise businesses are replacing their old traditional telephony systems with an IP based ones. A VoIP based PBX can provide many features such as: Multiple Extensions, Caller ID, Voice mail, IVR capabilities, Recording of conversations, Logging, Usage with hardware based telephones or software based (aka soft phones). Now days there are many vendors for PBX, IP telephones, VoIP services and equipment such as: CISCO, AVAYA and ASTERISK, SNOM, THOMSON… With new technology comes a new challenge for both the defensive and offensive side of security, One of the “great” dangers of traditional phone lines was that it was susceptible to eavesdropping. The “old school” way to eavesdrop on somebody’s phone line was to physically connect a small transmitter which was connected inside or outside their premises somewhere along the phone cord. IP telephony systems are also susceptible to eavesdropping, doing so in an IP environment is a little bit more difficult to execute, detect and require more the knowledge and the right set of tools. ACE can be used in one of two ways. First, it can auto-discover the TFTP Server IP Address via DHCP, or (second) the user can specify the TFTP Server IP address as a command line parameter of the tool. In either case, you must supply the MAC Address of the IP Phone with the -m option in order for the tool to correctly download the configuration file via TFTP.